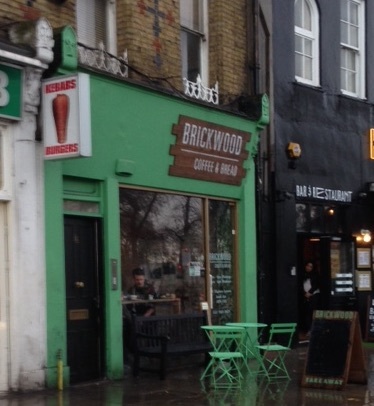 It was raining heavily as we met friends for coffee at Brickwood, near Clapham Common, a few weeks back. Inside it was fairly crowded so we were shown to a cosy little area downstairs where we found a table. The staff were all friendly and with coffee roasted by Caravan, it was easy to sit and enjoy a great Americano while waiting for the others to arrive. Sadly, all of the cakes on the menu contained nuts (with the exception of scones). This was a shame because it was otherwise an interesting place to sit and observe the surroundings and it would have been nice to have been able to give it a ‘tick’ in the cafes with good nut knowledge box*. Still, the coffee was very good and there was plenty to observe, even in the basement. 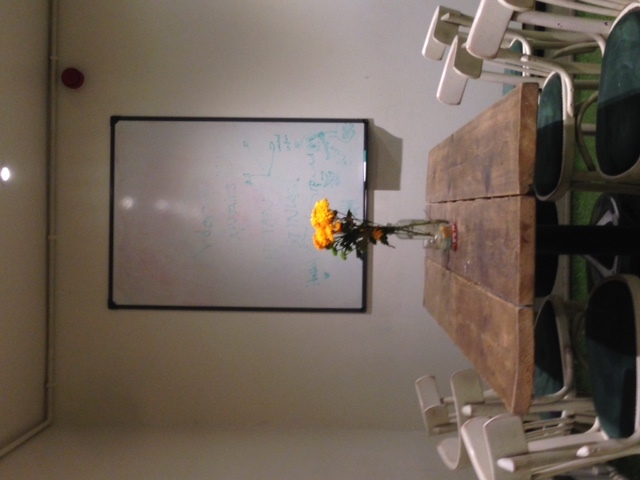 Glancing around the room, the first thing that struck me was a white board on the wall. Taken together with the artificial lighting (necessitated by the area being in the basement), this was highly reminiscent of the maths ‘common room’ at work. A further mathematical connection comes from the fact that the grandfather of John Venn (of the Venn diagram) lived nearby. A prominent local clergyman, Venn St, just around the corner from Brickwood, is named after him. Still, that is quite a digression. There were also interesting bits of physics and science to notice in the café itself. Grass or concrete? What factors control the bounce of a tennis ball. 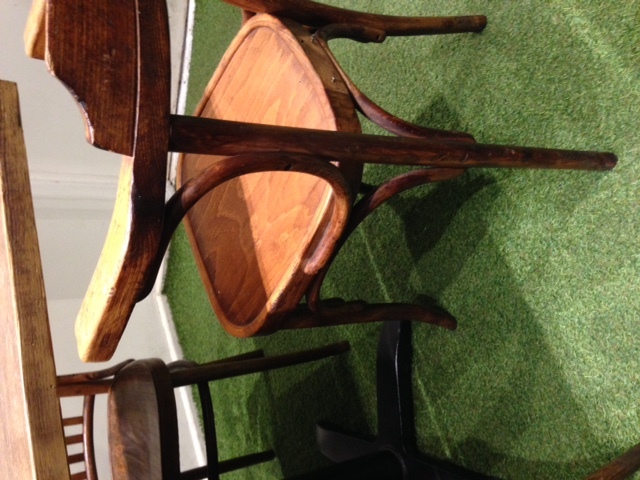 Downstairs, the floor was covered in what appeared to be an artificial grass. This gave the whole experience of having a coffee here a bit of a surreal twist. Just as happens with real grass, a path was visible on the ‘grass’ where people had walked, something that can be used when rambling in the country to help you find your way around (when GPS or map temporarily fail you). The book “The Walker’s Guide to Outdoor Clues and Signs” gives many such details about how to navigate in the country without a map (including how to tell from trees which way is North). However, as we are now in the second week of the Wimbledon Tennis tournament, this cafe-physics review is going to have a tennis slant instead. We could think about how different it would be were we to drop a tennis ball onto the ‘grass’ downstairs, or (what I remember to be) the wooden floor upstairs. Tennis started off as an indoor sport, played on courtyards in stately homes and monasteries. ‘Lawn tennis’, or what we now recognise as just ‘tennis’, developed in the nineteenth century and was played on grass. Thinking about how a tennis ball would bounce on the floor in the basement or upstairs in Brickwood is therefore somehow reminiscent of the history of the sport. Tennis balls are designed to bounce 53-58 ” (134.6-147.3 cm) when dropped onto a concrete floor from a height of 100″ (254 cm). Other surfaces have different elasticity and/or friction. The behaviour of the ball will be quite different therefore when it bounces on different surfaces, affecting the speed (and therefore height) and even angle of the bounce (for more info on the physics click here). The different characteristics of the surfaces mean that different types of play are required to succeed on the court. To be successful across all courts (from the clay of Roland Garros to the Decoturf of the US Open and the grass of Wimbledon) requires a tennis player who can adopt many different playing styles. Would it help a tennis player to have a training in physics and an understanding of the details of aerodynamics, spin and friction that are involved as the ball whizzes through the air? Probably not. But for us mere observers who prefer eating the strawberries and cream and savouring great coffees while discussing the game, a bit of physics may perhaps add to our enjoyment. *to be fair, Brickwood did have “good nut knowledge”, they knew all their cakes contained nuts. Perhaps the tag needs revising to be “nut-allergy-friendly”.